The source reports a government allocation of 500 million rubles ($16.7 million) in 2010 to start a project of a nuclear powered spacecraft, with a projected total investment of about 17 billion rubles (over $580 million) by 2019. 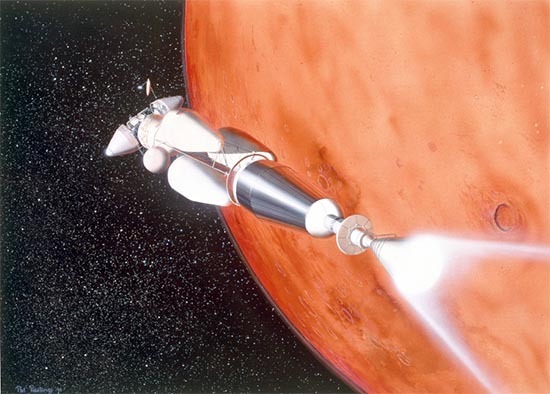 The engine will be used for interplanetary manned missions targeted to the Moon and Mars. A recently leaked document from Russian space agency drafted an ambitious plan for planetary exploration, both manned and unmanned. Nuclear power is generally considered a promising technology for interplanetary exploration, especially beyond Earth’s orbit, where solar power gets weak. NASA has been trying to promote nuclear propulsion several times, including a project in 2003, but funding was eventually cut down. In the video below, a review of project Orion, the most ambitious nuclear propulsion project developed by US.